Website monitoring tool monitors performance of the websites in real time. Secure monitoring utility checks the uptime, down time and response time of the websites and web-based application with support to different types of internet application protocol including HTTP, HTTPS, FTP, POP3 and SMTP communication protocols. GUI enabled wizard software is helpful for business purposes for checking the performance and availability of websites with acceptable response time. Performance monitoring tool checks the status of websites and sends an immediate alert notification to you if your websites is inaccessible, improperly load or in offline status. When the website is down due to common instances such as Host not found, Server not found, Page not displayed, Low bandwidth, Low connectivity, Network problem etc. then software alert about the website offline status to the user by sending an E-mail or runs a specific program or beeps a sound. » Checks the status and performance of websites in real time. 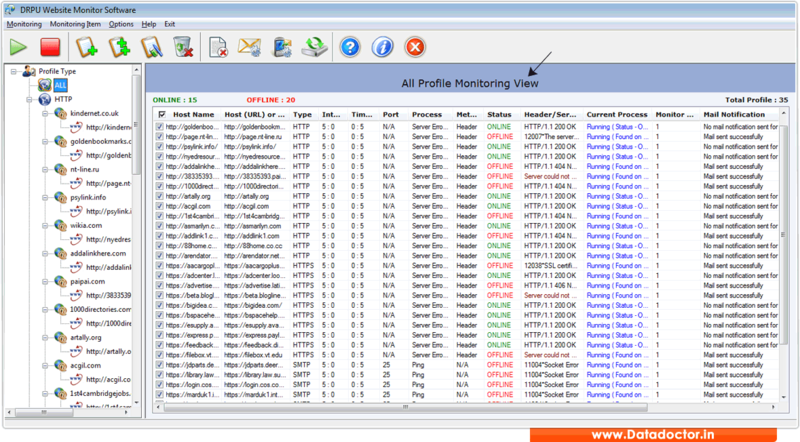 » Monitors the uptime, down time and response time of the websites and web-based applications. » Sends the immediate notification to you by sending e-mail beeps sound or runs a program in case of inaccessibility or offline status of websites. » Alerts user when website is down due to various error messages including host not found, server not found, network problem, low connectivity etc. » Software supports different types of internet services including HTTP, HTTPS, SMTP, POP3 and FTP protocols. » Software is helpful for business purpose by ensuring availability of the website around-the-clock.